A hearty favorite, great for a family meal. In a food processor, puree onion, carrots, celery and garlic into a coarse paste. In a large pan over medium heat, coat pan with oil. Add the pureed veggies and season generously with salt. Bring the pan to a medium-high heat, and cook until all the water has evaporated and they become nice and brown, stirring frequently, about 15 to 20 minutes. Add the ground beef and season again generously with salt. Brown the beef. Cook another 15 to 20 minutes. Add water to the pan until the water is about 1 inch above the meat. Toss in the bay leaves and the bundle of thyme and stir to combine everything. Bring to a boil and reduce to a simmer, stirring occasionally. As the water evaporates you will gradually need to add more, about 2 to 3 cups at a time. Season with salt, if needed simmer for 3 1/2 to 4 hours. 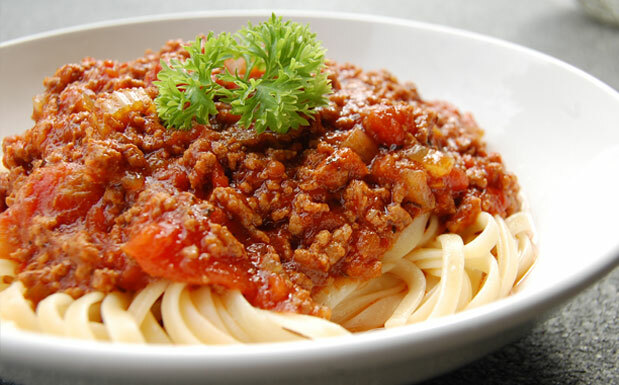 During the last 30 minutes of cooking, bring a large pot of salted water to a boil over high heat to cook the spaghetti. When the water is at a rolling boil, add the spaghetti and cook for 2 minutes less than it calls for on the package. Reserve 1/2 cup of the pasta cooking water. Drain the pasta and add 1 cup of sauce to the pasta. Stir or toss the pasta to coat with the sauce. Add the reserved pasta cooking water and cook the pasta and sauce together over a medium heat until the water has reduced 1 minute. Turn off the heat and add Parmigiano and a drizzle of extra virgin olive oil. Toss or stir vigorously. Top with remaining grated Parmigiano. Serve immediately.